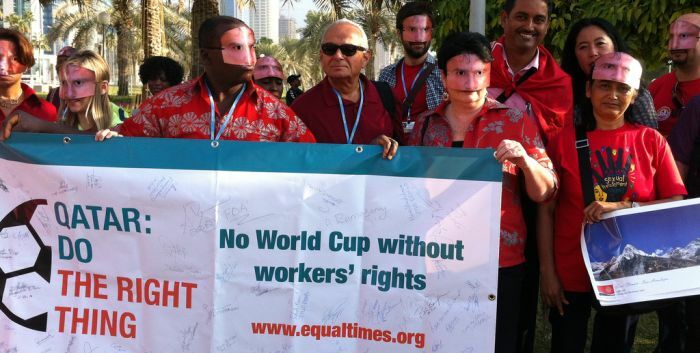 Qatar’s new World Cup worker welfare standards do not deliver fundamental rights for workers and merely reinforce the discredited kafala system of employer control over workers, warned the International Trade Union Confederation. “Forced labour continues in Qatar today with no workers’ rights. No migrant worker can be protected by any safety standard unless they have the right to collectively speak out about wages and conditions at work,” said Sharan Burrow, General Secretary, ITUC. The kafala visa sponsorship system ties workers to their employers, as they cannot leave the country or move to another employer without permission. Qatari law denies migrant workers the right to form or join trade unions. “Not a single change has been made or recommended to Qatar’s laws that deny workers their fundamental rights. No workplace voice or representative is allowed for migrant workers in Qatar. A worker welfare officer appointed by the employer is no substitute for a duly nominated worker representative. “The promise to provide freedom of movement for workers is a sham, as Qatar enforces segregation of workers on a racial basis. “These standards are built on an old, discredited self-monitoring system which has failed in the past in Bangladesh and other countries where thousands of workers have died. “With no legal compliance mechanism such as a tribunal, there is no possibility of enforcing even these provisions,” said Sharan Burrow. • Only applies to a limited number of workers in Qatar. “If FIFA are serious about Qatar continuing to host the World Cup in 2022, they will demand freedom of association such that workers can be represented by those they choose. “They will demand immediate steps to end kafala, immediate steps to give workers the rights to negotiate wages and conditions and set up effective legal compliance through a tribunal system for complaints,” said Sharan Burrow.